Without the Groups Scholars Program, Ramir Williams knows that his life would be different. A senior studying sports communication and broadcasting from Indianapolis, IN, Williams joined the 2015 cohort of the program to help make his college experience affordable. A year before he had lost his mother, a loss that weighed on him as he prepared to attend Indiana University. But with the help of the staff and advisors of the Groups Scholars Program, he was able to work through the obstacles that awaited him and find success at IU. “It’s the care they provide outside of business hours, outside of work hours, that’s been so influential for me,” Williams said. 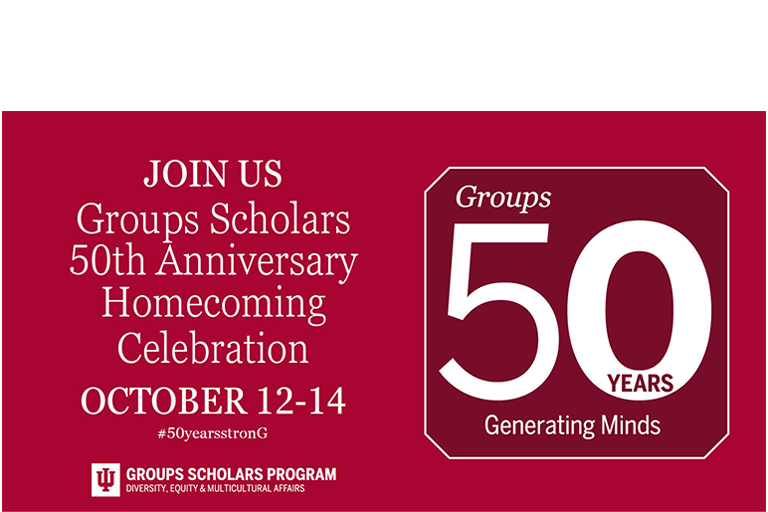 Williams is only one of the thousands of students impacted by the Groups Scholars Program, which celebrates its 50th anniversary this year. Since 1968, the program, which is supported by the Office of the Vice President for Diversity, Equity, and Multicultural Affairs, has brought tens of thousands of first-generation, underrepresented students to Indiana University. Once they arrive on campus, the program provides scholars with scholarships and a robust academic and personal support network designed to help them succeed. In aiming to overcome the obstacles that first-generation and underrepresented students face, the Groups Scholars Program has not only developed into a key support network. It has also become a pivotal foundation in its scholars’ college experiences, helping them build lifelong friendships that continue to enrich their lives long after college. Dawn Ridley, an Indiana University Graduate and member of the Groups Scholars cohort of 1986, has seen the impact that these friendships have had on her own life. When she attended the summer orientation for the program, she recalls the program’s then-director, LaVerta Terry, instructing students to look at the classmates around them. A sizable percentage of the group, she said, would not make it to graduation. It was the job of the Groups Scholars advisors and staff, Terry said, to reduce that gap, ensuring that as many students as possible were able to complete their education. To combat these difficulties, the Groups Scholars Program takes an approach that blends financial support with a relationship-focused cohort model. Each year, the newest cohort of scholars arrives on campus during the summer, several weeks before school begins. Once on campus, they take classes that prepare them for the rigors of college and participate in activities that connect them with a large network of faculty and staff advisors. This intensive orientation also helps scholars form extremely strong friendships with their advisors and each other--friendships that ultimately guide them throughout their college experience. “This campus is pretty large, and I think it gives them a sense of belonging, being part of something bigger than themselves,” said Mary Stephenson, the director of the Groups Scholars Program. Destiny Babilonia, a freshman Groups Scholar and psychology major from Hobart, IN, has already experienced the power of these friendships. In her first months on campus, she was struck by the depth of the friendships she formed during the summer orientation, as well as the lengths that Stephenson and the other Groups Scholars Program staff went in making these friendships possible. As she looked towards the rest of her academic career at Indiana University, Babilonia was confident that the relationships she has already formed through the Groups Scholars Program will continue to influence her for years to come.